How does she do that? To date, I’ve only had one person who could correctly guess at how I make my “Crystal Balls,” so here is the answer in all its detail! My “Crystal Ball” series is created with a home-built fish-eye lens consisting of a peep hole for a door mounted into a lens cap. It’s an old trick, but a good one when you can get all the mechanics just right. Although the lovely spheres and halos can be created in Photoshop, I prefer to do the magic in-camera. The resulting halos are like fingerprints unique to each picture and vary depending on the subject, the angle of the sun, clouds, etc. My own construction is not the most esthetic job when looking at my camera, but it is quite functional and the first one I build lasted 10 years before succumbing to an unfortunate accident. I choose to use this lens on a medium-format film camera. Not only am I a fan of film, but the larger format allows for as much detail as possible. 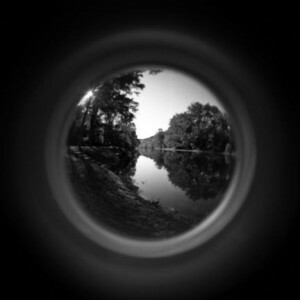 The peep hole creates a tiny image relative to the image frame and is not the greatest piece of glass. You lose a lot of detail shooting through every extra piece of glass on a camera to begin with, and this can really mute the details in the final picture. 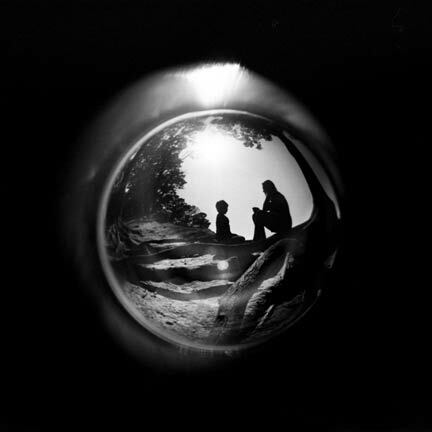 With the medium-format camera, the negative is about the same size as the peep-hole lens itself, so there is a minimum of detail loss. I also use the larger models of peep-holes, the ones with a 1-inch-diameter lens. 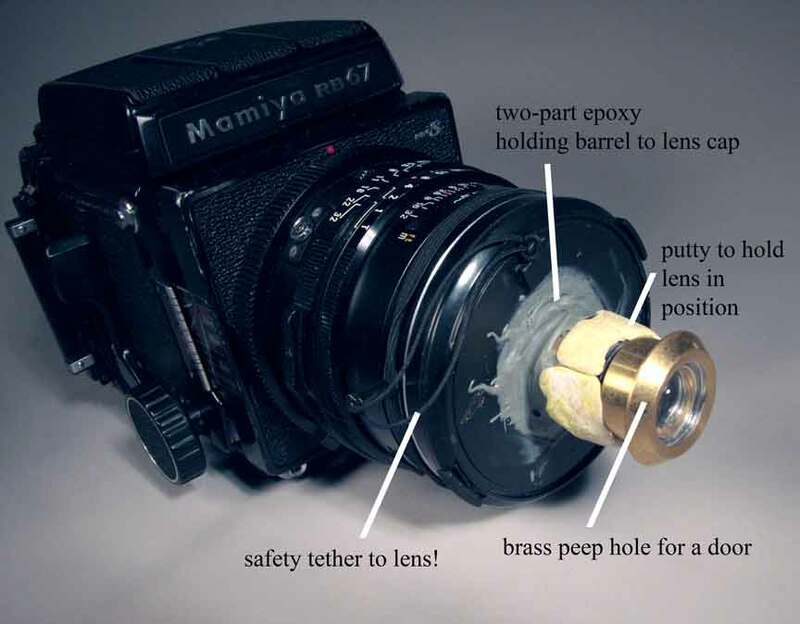 Some people love to mount these cheap lenses to digital point and-shoots and there are some very good explanations as to how to build “$5 fish-eye lenses” on the web. Some are more elegant than others, but the general idea is to put the front half of a peep-hole on the lens of the point-and-shoot and secure it with duct tape or by gluing it to a tube that slides over the extended lens of the camera. 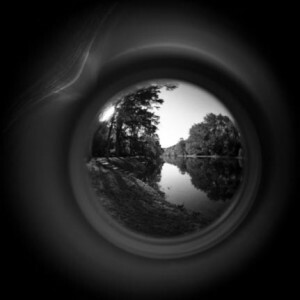 The peep-hole lens is a very simple piece of equipment and a joy to use! Click to see im better detail! My lens is mounted onto a lens cap by cutting away the locking mechanism on the back of the lens cap (or you can use a slip-on cover if you can find one) and then cutting a hole in the center of the lens cap to fit the larger half of the peep hole barrel. Place the back end of the barrel through the back of the lens cap and secure with two-part epoxy. Then, screw the front end into the barrel, making sure not to extend the front half past the eye piece on the back. Screwing the lens back to far will make it hard to focus, and, more importantly, may scratch your lens! Once the glass is screwed on, I check the focus through the camera lens to make sure the distance is right, then secure the lens with more epoxy or putty to keep it from unscrewing or screwing itself in too far with vibration. Most importantly, I have a tether from the lens cap to the camera! The weight of the peep hole is enough that if the cap is not on securely, it can fall off and break. I learned this the hard way! This set-up is mounted onto a “straight” 90 mm lens, roughly the equivelent of a 50 mm lens on a DSLR. A wider-angle lens will make the image smaller. A zoom lens will enlarge the picture and cut off the edges of the halos. Zoom far enough and you can even shoot directly through the peep-hole to make a rectangular image, if you like! 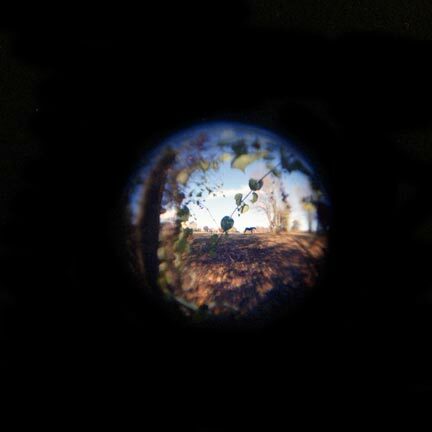 A smaller peep-hole. This one did not get rim flares regardless of where the sunlight hit it and there is heavy distortion around all but the very center. The lens I choose to use. It is a different brand from the first two. 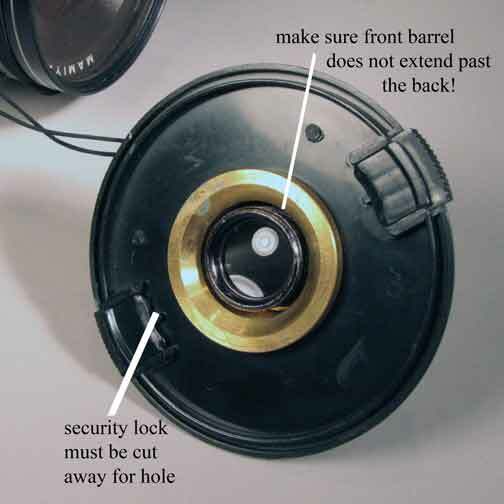 This one has a brass barrel, 1-inch lens and just enough rim showing to make dramatic halos. Though not as clear as an expensive lens, the distortion is mostly around the edges. A third-generation, informally trained photographer, Heather Siple has been taking pictures since she was old enough to hold a point-and-shoot steady. Her work has appeared across the US and internationally in museums, galleries and publications. Siple is the founder of the photo group ArtLane PCG . 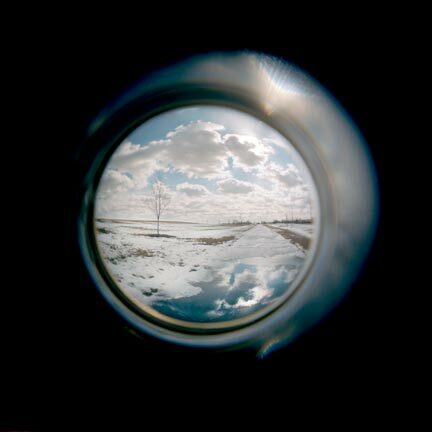 This entry was posted in Equipment Notes, Uncategorized and tagged equipment, peep-hole lens, photography, point-and-shoot, toy camera. Bookmark the permalink. Pat on Yes, But Is It Art?